The state of Michigan recently released the results of its 2018 engagement survey of state employees. Michigan has conducted six surveys since 2012, as a key part of its long-term commitment to measuring and improving engagement. About 75% of the state’s 45,000 employees responded to the 2018 survey. This year’s results revealed that 75% of responding employees are engaged – and 53% are highly engaged. Since Michigan’s first survey in 2012, the percentage of engaged employees in every state agency has increased. 41 obsolete reports have been eliminated. Despite these impressive results, Michigan is an outlier – one of the few states that conducts regular statewide employee engagement surveys. In contrast, the federal government, as well as many cities and counties, conduct periodic surveys. Most states, however, have been reluctant to do this statewide, preferring not to conduct them or allowing individual state agencies to go it on their own. The last time my organization, the Institute for Public Sector Employee Engagement, inventoried the states, we identified only seven that conduct regular statewide surveys. Why not more? There are probably a few reasons. First, there is the size and scope of state governments and the dispersion of state workforces. It’s one thing for a city to survey employees when all or most of them are in the local geographical area. It’s far more complex to do this in a state with tens of thousands of employees in hundreds of locations across a large geographical area. Lots of logistical problems. Second, perhaps state leaders don’t understand the business case for measuring and improving engagement. 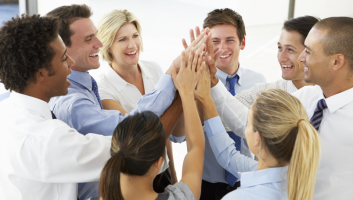 They may view employee engagement as just another touchy-feely HR project. And then, of course, there’s the ever-present political risk. What if the survey shows a low level of engagement? Bad optics. But these are not insurmountable challenges. The federal government, the nation’s largest employer, surveyed almost 1.5 million employees in 2018, at locations around the country and even around the world. In the private sector, multinational companies regularly conduct worldwide employee surveys. Think about the logistical challenges of designing and administering a survey of employee around the globe who speak multiple languages and have widely divergent cultures – and then analyzing and acting on the results. But these companies do it regularly. In state government, states like Michigan and Tennessee have overcome the logistical challenges of regularly conducting statewide surveys of tens of thousands of employees and generating high response rates. Even California, with more than 200,000 state employees, is offering a standardized employee engagement survey to state agencies. As for the business case, decades of research, including national polls conducted by our Institute, have clearly shown that improving engagement drives improved organizational performance and service delivery, including in government. Federal agencies, as well as many municipalities and private-sector companies, understand why focusing on engagement is critical. In August, the Wall Street Journal published the results of research on 693 large, publicly-traded companies. After analyzing these firms’ overall effectiveness based on 37 indicators, researchers found that employee engagement and development is the single biggest driver of superior performance. The “people factor” was more important than innovation, customer satisfaction or other factors. In government, our Institute’s national poll revealed that engaged employees in state government are almost twice as likely to believe that their organizations are successfully achieving their missions, compared to somewhat- or not-engaged employees. As for the political risk, I served for ten years in state government, so I’m not naïve about how politics drives decisions. However, maybe it’s time for state government leaders to take some political risks – in the interest of improving engagement and government performance. And the time is right, with 21 new governors about to take office. These new leaders will bring with them new ideas and policy initiatives. Governors must recognize, however, that their success will depend largely on the skill, commitment and performance of the thousands of career public servants in their states. Without committed and talented people, new ideas and policies won’t succeed no matter how exciting they may seem. Moreover, a particularly good time to conduct a statewide engagement survey is when a new leader takes office. A survey provides unique and invaluable data on how engaged the workforce is, what influences engagement, and how to create the best conditions for employees to be engaged. Then, after taking the temperature of the workforce, the new administration can address any workforce issues or barriers the employees identify in the survey. From a purely political standpoint, the new governor won’t have to own any problems, but can own the solutions. In other words, political risk is low and potential reward is high. This combination of circumstances will only occur once – when the new administration takes office. Improving employee engagement isn’t a partisan issue. Republican and Democratic governors alike should strive to maximize the effectiveness of their state workforces. State government—and state employees—play a critical in the lives of all Americans. That’s why the time is right to focus on creating the conditions for state employees to excel. The stakes are too high to do otherwise.